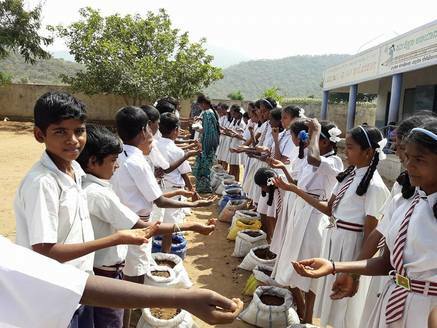 ​Teaching children to have their own kitchen garden.﻿ Susila Dharma USA﻿ has connected Anisha with the Guru Krupa Foundation of Jericho, New York. The foundation has granted Anisha USD $10,000 annually for a 4-year period (starting June 2016, to be reviewed annually) to train 1400 local secondary-school students of regional schools to plant and nurse organic kitchen gardens. These gardens will provide the students and their families with a plentiful source of nutritious organic vegetables and relieve the family food budgets. Seeds are supplied that can be conserved and multiplied to be used in next year’s kitchen gardens. The seeds will also be saved for distribution to local farmers from the native seeds bank maintained at Anisha’s Agricultural Resource Center. Hopefully, this 4-year project will expand and provide a model for future kitchen garden projects, both locally and in other drought-prone areas of southern India. And the students will grow into becoming agents of change in their communities and society at large. When the project started in June 2016, it was up to a bumpy start because there was no rain in the sowing and planting season. But everyone faced and overcame this special challenge very well and was satisfied with the results. 5895.4 kilograms of vegetables were produced in total by the participating schools: Varieties Name yield in kilograms:.Radish 746.5, Ladies finger 480.1, French beans 522, Tomatoes 676.5, Brinjal 709, Greens 448.3, Sponge gourd 845,.Bottle gourd 461.5, Pumpkin 735, Field beans 271.5,Total 5895.4". ​In the second year the economic benefit for the participating families has been measured for the first time, coming to the result that each family saves/earns approx. 6 USD/month. A substantial contribution/saving for the family budget for the majority of them. 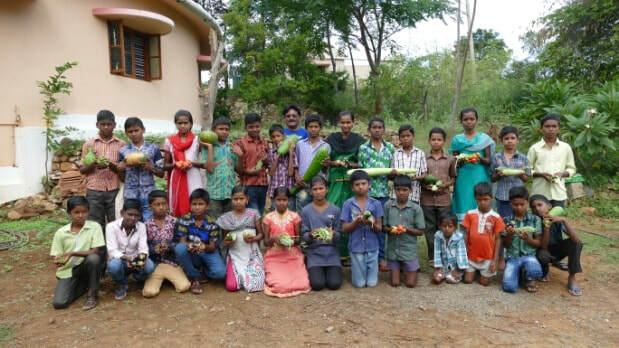 This program was designed to become an event for a number of reasons: Primarily it was an occasion for the children of Martalli Panchyath to get together and share their produce. It was decided that we give an opportunity for the children to involve in a group activity like cooking and sharing the meal. The response to this activity was overwhelming and more than 120 children gathered. They all brought vegetables from their gardens. 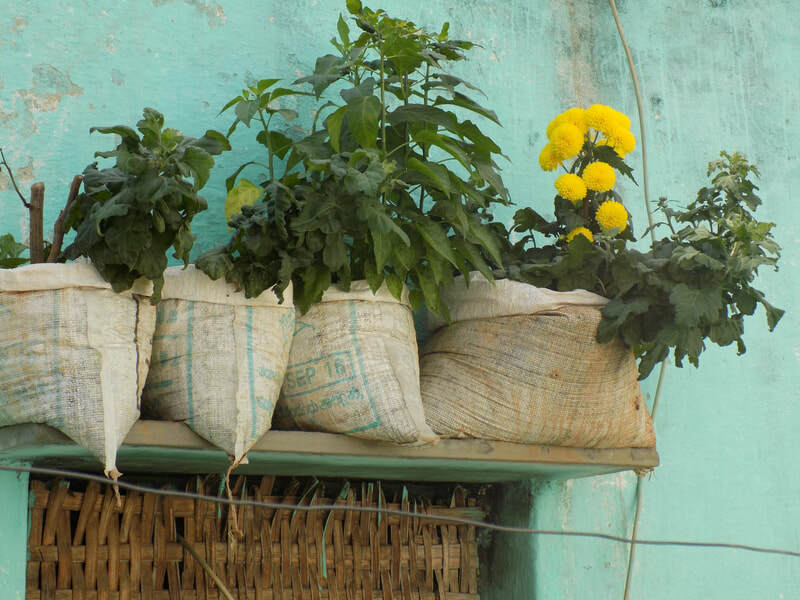 A dozen teams were formed and a stock of 130 kgs of vegetables thrown open to them. 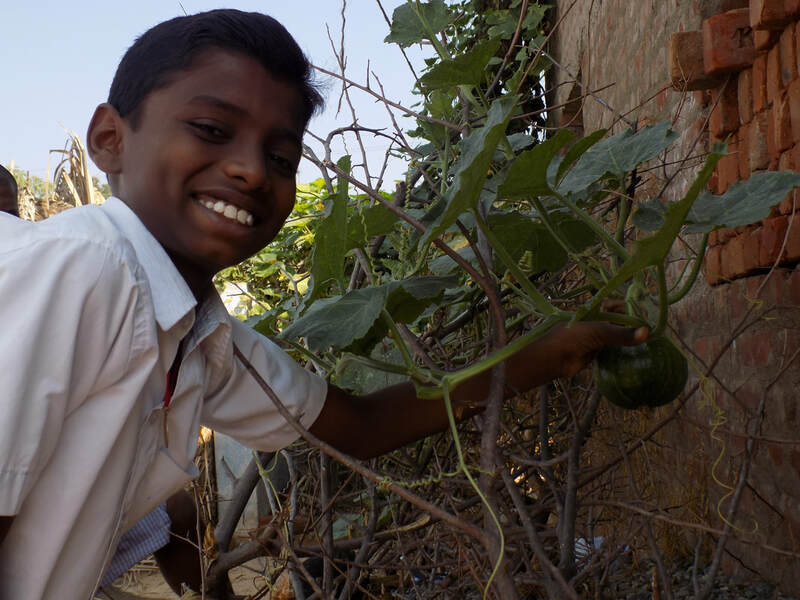 From spinach to mammoth sized bottle gourd, there were twelve varieties of vegetables in all, and the children had their choice of a copious share of garnishing materials from the kitchen and the garden at Anisha. The teams prepared about thirty dishes in three hours. There was a festive mood in the campus and children hurriedly carted firewood, chopped the vegetables and stirred the pot in a competitive frenzy. Mr. John Don Bosco, and John Britto, cultural delegates from the locality, were invited to taste the recipies prepared by the children and comment upon it. They both were spellbound by the results and applauded the culinary skills of the children and their knowledge of the nutritional values of the vegetables they had used. Anisha’s kitchen had cooked rice en masse which was served to all the children, and which they enjoyed with the curries they had prepared. The kitchen garden project with tribal communities was extended for a second year as they were very interested in kitchen gardens. It took place in three villages. Even though there was a water scarcity in the village these 130 families grew vegetables like radish, okra, field bean, tomato pumpkin, bottle gourd and sponge gourd. 102 families saved seeds from the previous harvest and Anisha provided seeds for the remaining 28 families. On an average 10-12 kgs. of vegetables was grown and consumed by each family. 130 families generated 1331 kgs. of vegetables and saved Rs.37,700/-. 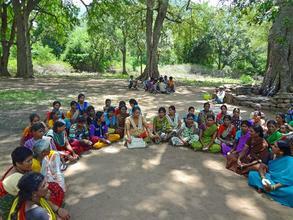 Anisha staff visited the villages once a month to provide ongoing support.